The emergence of vibrant pink sakura flowers signals the coming of spring after the chill of winter. Ordinarily, sakura in Tokyo area is in full bloom in late March. But the city of Atami, Shizuoka Prefecture, about an hour from Tokyo by shinkansen bullet train, boasts a much earlier blossoming, starting at the end of January - the earliest blossoms in the main island of Japan - known as Atami-zakura (Atami cherry blossoms). 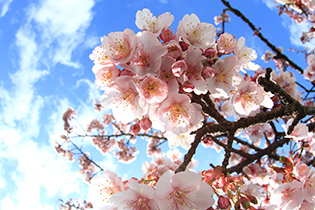 Along the banks of the Itokawa river, which runs through the city, the Itokawa Sakura Festival is held from January 20 to February 11. 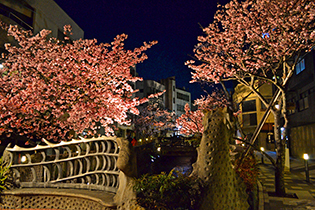 The riverside promenade comes alive with visitors enjoying the lovely blossoms, as well as various entertainments such as band performances and stalls serving sakura tea. Near the festival site, 20 minutes by car, The Ryokan Collection member Atami Sekaie opened a new wing, "Atami Sekaie Tsuki No Michi” (Moon Road), last November. 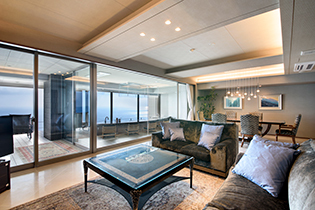 Its most impressive feature is its two penthouse rooms, “Tsuki No Michi” and “Kumo No Nami.” These two fabulous rooms are spacious and bright, and boast spectacular views of Sagami Bay. You can experience the ultimate in private luxury, and the exclusive feeling and luxurious atmosphere of these rooms have been the key to their popularity. Ever since they opened, they have received lavish praise from the guests who have stayed there. 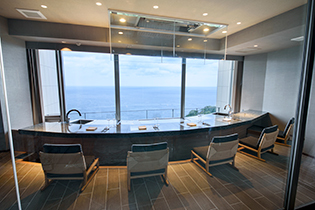 “Tsuki No Michi” features a special private counter kitchen where the chef cooks teppanyaki, tempura and other fine foods according to the liking of the guests, who can enjoy this exclusive dining experience while gazing out at the beautiful Sagami Bay. This feature is a favorite among the guests, and is one reason they are so enthusiastic about returning. 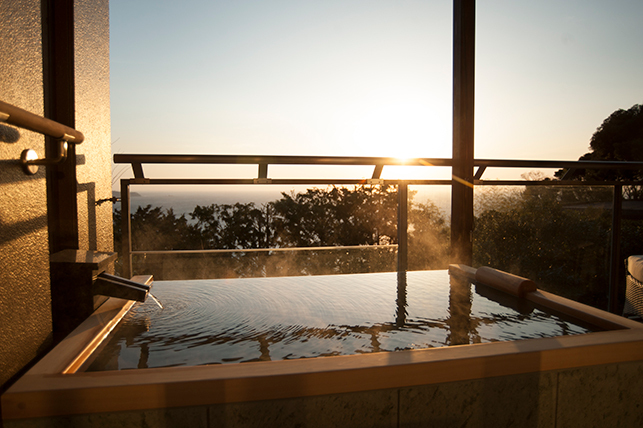 In both of the penthouse rooms, the rotemburo open-air bath is a luxurious feature - the perfect place to soak and take in the magnificent scenery and clear, refreshing air. Each penthouse room includes a dedicated cell phone to summon the exclusive butler, who quickly responds to any request to make your stay as comfortable as possible. 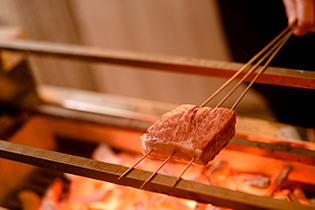 The restaurant, “Hitoshio,” offers cuisine with a fusion of Japanese cooking and charcoal grilling specialized in meat dishes. The interior is spacious and lively, but the tables are separated by partitions to create an intimate, private space, with spectacular views over Sagami Bay. In addition, the restaurant has a wide selection of wines and other beverages, and the expert wait staff are happy to offer advice on pairing with food. Atami is famous for its excellent seafood, and the chefs at Hitoshio are adept at selecting and preparing it to maximize its flavor, as well as that of the other fine ingredients from all over Japan. You can choose from a variety of delicious Japanese dishes, made from seasonal ingredients cooked to perfection using traditional techniques, from a menu that changes monthly. 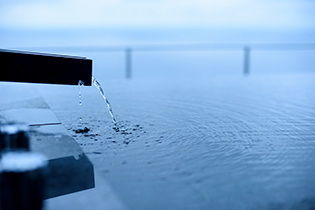 In addition, Atami Sekaie puts a strong emphasis on health and revitalization, with a “Wellness Menu” that offers a variety of activities, including morning yoga. One popular menu activity is “Gentle Fasting,” a program of careful calorie control that does without strict fasting. This includes a fun seasonal menu of delicious foods, beautifully prepared. Come and experience early spring at this first-class resort ryokan, where you can fully enjoy relaxation, revitalization and gorgeous views of the Pacific Ocean.